Black to play and win material. 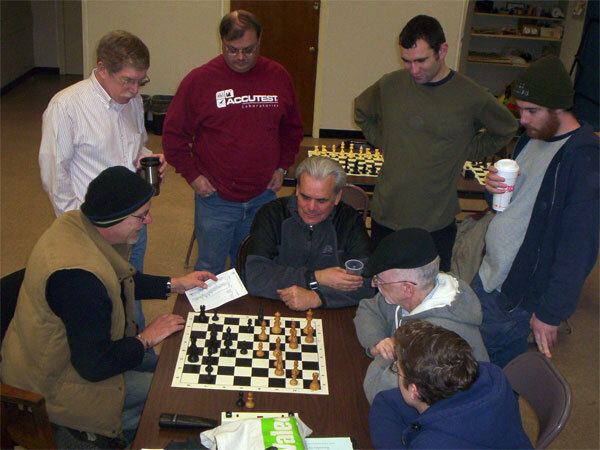 Last night, before and after play in Round 7 of the Kenilworth Chess Club Championship, FM Steve Stoyko entertained us with his games from the U.S. Amateur Teams East this past weekend. He began with his last round victory over a young Ukranian player who has a lot of potential once she learns not to "play for a draw" against a higher rated player, since that is a notoriously bad way to achieve a draw (especially if you are playing Steve).